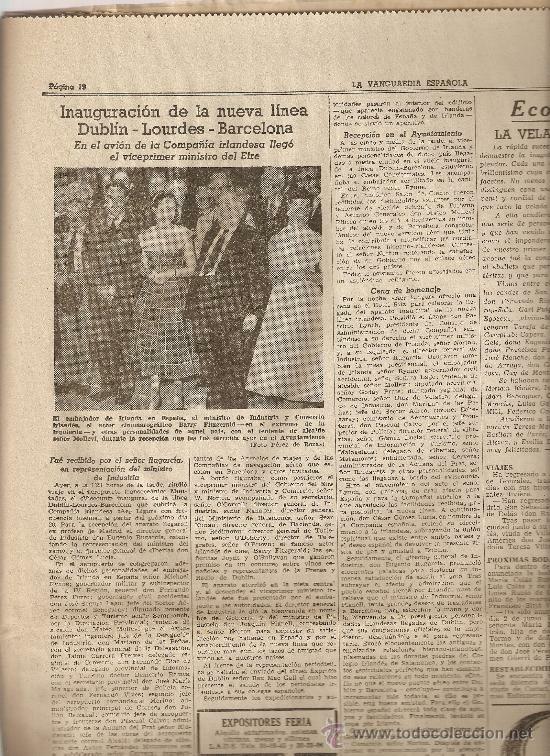 LA VANGUARDIA MAYO 1955.INAGURACION CORTES.TARREGA.DUBLIN. LONDRES . BARCELONA .PUBLICIDAD. EL DIARIO MAS LEIDO DE CATALUÑA DONDE DESTACA:REPORTAJE SOBRE LA INAGURACION DE LA NUEVA LEGISLATURA DE LAS CORTES ESPAÑOLAS BAJO LA AUTORIDAD DEL JEFE DEL ESTADO.CONSTA DE TRES FOTOGRAFIAS EN PORTADA.REPORTAJE SOBRE EL MERCADO DE AUTOMOVILES Y TRACTORES DE TARREGA.CONSTA DE COMENTARIOS INTERIORES.REPORTAJE SOBRE LA INAGURACION DE LA LINEA AEREA DUBLIN,LONDRES,BARCELONA.CONSTA DE MEDIA PAGINA Y UNA FOTOGRAFIA.REPORTAJE PUBLICIDAD SOBRE EL CAVA CODORNIU,TODA LA PAGINA DE LA CONTRAPORTADA. LA VANGUARDIA MAYO 1955.PUBLICIDAD FUNDADOR.CHANEL.MAIZENA. JARDIN ZOOLOGICO DE LONDRES. NOTAS GRAFICAS MADRID Y PROVINCIAS. LA VANGUARDIA 28 MAYO 1930. 4 P.
Hora oficial TC: 03:11:11 TR: 82 ms.